When I briefly read about Final Light, The Prison I was intrigued. I love 2D adventure titles I’m a horror enthusiast so when I read that this game played like a Metroidvania set in a ghost prison I took notice. In fact the first thing I thought of was the underground prison in Silent Hill 2 – one of my favorite gaming memories of all time. I only wish I had done a little more research before signing on to cover Final Light, which turned out to be an entirely different type of horrific experience. As mentioned, Final Light is set in an abandoned prison that is now haunted by spirits. Forty years ago this facility was used as a secret internment camp, leading to many deaths for the enemies of the Black Butterfly, a mysterious and sinister group. Of course now the prison is full of angry spirits that want nothing more than to kill you – so you must kill them first and set them free. Up to this point the game was good, but it soon took a turn for the worse after the title screen faded away. From the get go there are obvious grammatical errors in the text and most likely some translation hiccups in the process. To make matters worse the load time to boot up the game is absolutely horrendous and worse than any original PlayStation or Saturn game in memory. It doesn’t help matters that dreadful sounding choir music is playing in the background – I almost muted my TV. Then you’re simply dropped into the game with no background on who or what your character is. It’s hard to make out many details on your poorly animated main character, but he does have two flaming blades for arms and a jet pack to assist with jumping. The gameplay is confusing and poorly executed. The main selling point is a Metroidvania title, but it bears little resemblance to anything about what makes those games great. You traverse through the prison’s interior, fighting off and freeing spirits, gathering roses, knocking down walls, and collecting new weapons. I’ll mention the art soon, but there’s nothing at all unique about the area you’re supposed to be exploring, as most of the areas look nearly identical to each other. The game has the option to be randomly generated, so unlike a game like Symphony of the Night, with distinct areas like “Marble Gallery” or “Long Library’” here all you have is one bland and bleak prison. Whether attacking, jumping, and or even picking up items, all of the controls and movement feels stiff and clunky. The combat against common enemies is sluggish, dull, and too easy – and the boss battles don’t spice up the game at all. There are many hazards in the game such as falling, flaming ceiling tiles and spiked pits, and with the poor controls I found even jumping over these to be difficult. One slight positive: there are many weapons, such as lasers and grenades, that you can collect or purchase to add some variety to the combat. The interface is dreadful and one of the worst I’ve seen since the NES days. There is no menu screen or anything else to examine. You can pause the game, and that is it. There’s no information or explanations on anything and it took me awhile just to figure out what the bars and numbers on the game screen meant. The map appears in the top left, but there’s no way to enlarge it. There are vending machines in the game where you can spend your roses, but even those are confusing to use. If you die, you get three continues, but if they run out, or you simply wanted to restart the game – you still retain all of your souls freed, roses collected, and experience points. This mechanic reminded me of Dead Rising. One of the only options you have is to continue the game with a newly generated level, or stick with your current one. Either way, you’ll be suffering through more load times. The gameplay is very poor – but the graphics, music, and sound effects surely will cement this game as one of the very worst games on the Switch. The game’s art style is dark and ugly. It’s hard to make out any details on your main character or the common enemies. The bosses are larger, but that makes them look even worse, and they lack the creativity of a Castlevania or Metroid title. A few details are added here and there to the prison such as bats flying around, corpses chained to the walls, mountains outside – but mostly it’s just corridors and rooms that all blend together. The sound effects of your character grunting and the demons howling in no way makes me want to play more. How about the embarrassingly placed ‘Hallelujah’ sound bite that plays when you get a new item? Sound enticing? The title screen music is weird and doesn’t fit, the in-game OST is bland – but the game over/continue BGM has to be heard to be believed. It’s a bizarre mixture of wailing noises meant to be music with what sound like dinosaurs roaring and loons singing. I have no clue where they were going with this. I was mildly excited for this game given the description, but EnjoyUp Games’ track record along with the $6.99 price tag should have set off alarms. I understand this game is obviously a low-budget title and expectations shouldn’t be too high, but it does little to explain itself and features poor control, graphics, and sound. The fun-factor is simply non-existent. The load times in the game are enough to make anyone turn it off without even getting started. Given the amount of terrific indie titles on the Switch there is no reason to play Final Light, The Prison. 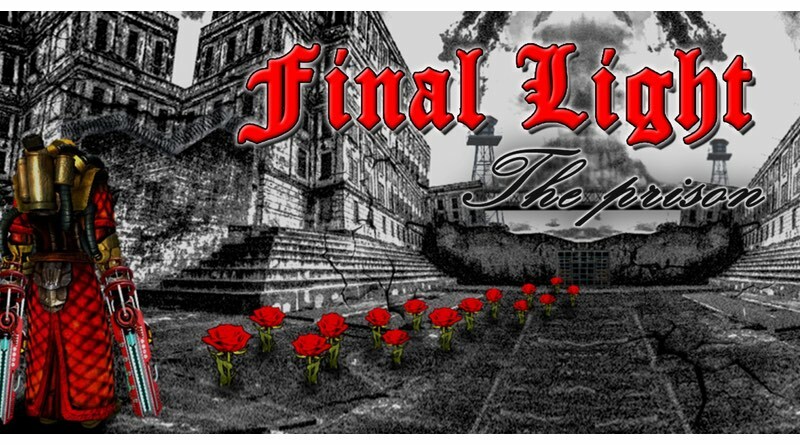 Final Light, The Prison was reviewed using a final retail Nintendo Switch download code provided by the publisher.